Do you presume to criticize the Great Oz? You ungrateful creatures! Think yourselves lucky that I'm giving you audience tomorrow, instead of twenty years from now. Oh -- oh oh! Oh - I - Pay no attention to that man behind the curtain. The Wizard Of Oz, By Noel Langley,Florence Ryerson and Edgar Allen Woolf. Pay no attention to that man behind the curtain...have you ever stepped back from this virtual world to consider the whirring gears and spinning spindles that make this machine in your hand work? I know these metaphors are industrial age vintage, I should have said these flowing electrons and particles of light...in any case, this virtual world is man-made. Every bit, byte and pixel is programed. Sometimes created with good intentions, sometimes made with malice of intent and many times with no thought given to the unintended consequences of creation. Do you find the fact that virtual reality has become the primary reality for many people surprising? Here we are virtually face to face. When you are in a public space notice how many people are looking at screens. How many hours a day do you log on? 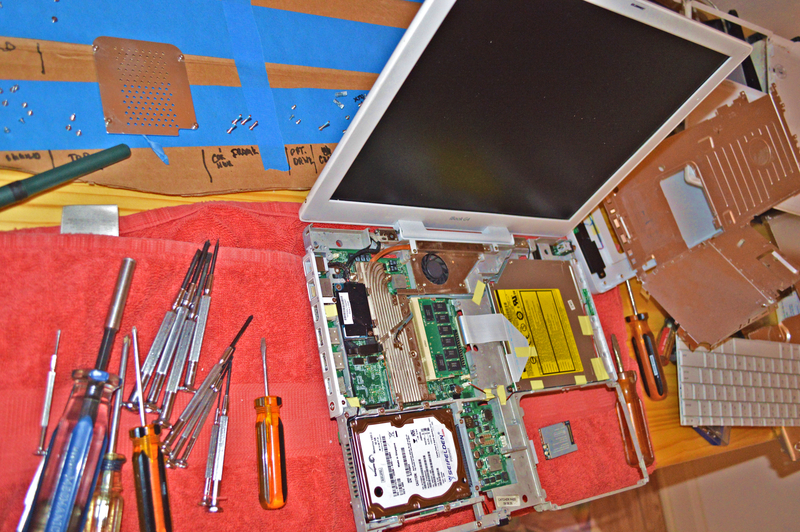 My old laptop stopped working recently and I took it apart to see if I could fix it. How 20th century of an idea... As I disassembled the familiar interface, screw by clip, into it's various plastic, aluminum and circuit board parts, the idea that a computer as a metaphor for religion came to me. Religions are man-made in their various parts, e.g. institutions, rituals, ideas, dogmas. When assembled, they create their own reality of the world; good, bad and unintended. Computers and religions are both vehicles of communion and communication. The idea that these virtual worlds can be accepted without thought as to intent is dangerous both psychically and spiritually. Let's be clear that man is behind the curtain of these machines. Be aware of how you use them...and more importantly, how you are used by them. A work of fiction is much the same, ie in creating (or perpetuating) a particular model of the world, often quite insidiously. In the past that property has many times been used to sharpen and enhance people's awareness of the reality and significance of various aspects -- and also used to soothe them into illusion and to maintain distorted ethical relationships. yet how many people have any critical awareness of how very effectively these things continue to shape their thoughts and feelings? Thank you Forrest for the insights. All of your examples can be used for "good" as well. It is our awareness of the intent that is important. Manipulation is not persuasion, does not recognize the other person as a fellow poorsoul but as an object to be worked on, whether or not the manipulation is well-intended. There is also unconscious manipulation, in which the manipulator wishes to justify his own bad compromise by perpetuating his example in other people. Forrest Curo wrote: "Manipulation is not persuasion, does not recognize the other person as a fellow poorsoul but as an object to be worked on, whether or not the manipulation is well-intended." Forrest, this is a powerful insight! Some chronic manipulators believe they are doing everyone else a favor by "rigging" decision-making to get their own way. Aside from common usage, there's a distinction we really need to make between methods that are kosher and methods that are essentially illegitimate.